About 5,000 armoured vehicles 1990-2016. A source of immense relief in particular for the Berliners and separated families was the reunification that followed the destruction of the infamous wall and the dissolution of the GDR. The wall was erected in 1961, and only the peaceful Revolution 13 October 1989, followed by a final Settlement on 12 September 1990 and reunification 3 October 1990 ended this still very vivid and utterly sensitive part of the German memory and one of the most compelling situations provoked by the iron curtain and the cold war. However, the reunion of 1/3 of the territory and people was just one side of the problem. Economically, East Germany was in shambles, and Bonn saw rapidly the “cost” of the whole “operation” of reunification not in a pleasing way. As a side note for what we are concerned for, the Bundeswehr inherited large stockpiles of obsolete/worn-out soviet or locally-built armored vehicles. Due to NATO standard, most have been simply put in storage pending scrapping, but some vehicles were kept only for local security purposes pending replacement. The East German Army (Nationale Volksarmee or NVA) indeed, established in 1956 was disbanded in 1990, but still strong of 767 aircraft (helicopters and fixed-wing aircraft of which 24 were MiG-29s), 208 ships, 2,761 tanks, 133,900 wheeled vehicles, and 2,199 artillery pieces among others. A Compulsory service 18 of month had been established in 1961, and faithful to the Soviet tactics of the time, relied on large numbers of these conscripts for operations, among these the Kampfgruppen der Arbeiterklasse (militia of workers) that a bit like a reserve army received little training in a regular basis after being draft in compulsory service. This auxiliary party militia was 210,000 strong and can be mobilized rapidly in case of war, along with three mobilization divisions and two reserve divisions in D+2. The regular Landstreitkräfte (Ground Forces) had a strength of 108,000 men, distributed among 9 motorized divisions (Motorisierte-Schützen-Division) and two Armoured divisions based at Dresden and Eggesin. Among specific units that were disbanded were the 50,000 strong BDR (Kommando der Grenztruppen) border guards operating along the wall. Among the 2,761 tanks were BMP-1 and BMP-2 IFVs (Panzergrenadier units), BRDM-1 and BRDM-2 Amphibious armoured recce vehicles, BTR-40, BTR-152, BTR-50, 60 and 70 APCs (Which formed the bulk of the motorized units), PT-76 Amphibious light tanks, some T-34 converted in modified recovery/engineering versions, T-54 of various versions manufactured in Poland and Czechoslovakia (reserve), T-55 upgraded to the T-55AM standard and T-72s of Polish, Czech and Soviet manufacture which formed the bulk of the MBT force. The Heer absorbed the army of East Germany, starting on 30 June 1991. After the merger, the new Bundeswehr was 360,000 men strong dispatched in four corps (one created with the former East German army), but the end of the cold war had an immediate effect of downsizing it over the years. Changes included the III Corps being reorganized as the German Army Forces Command (1994) and the 25th Airborne Brigade being converted into the special forces leading unit, known as the Kommando Spezialkräfte. The IV corps based in Potsdam in East Germany heads the 13 and 14th Panzer-Grenadier Divisions. It took years for the ex-East German Armoured vehicles to be “digested” and recycled. The remainder made the day of private collections and museums around the world. This did not change much the organization of the Bundeswehr but the creation of new military districts, often based on the ancient ones in East Germany, although many bases and barracks were closed, the BDW being a smaller professional army as opposed to a conscript army. By the 2001 reforms, the army was scaled down once more, to a seven divisional structure: 5 mechanized (2 mechanized brigades each), 1 special forces, and one airmobile (three corps). Emphasis was put on the creation of a rapid reaction force to be dispatched in foreign theaters of operations. 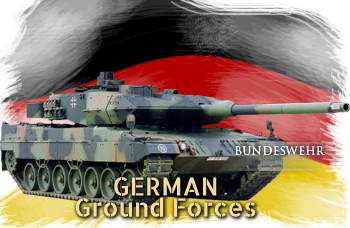 In 2003 a joint German/Dutch Corps, was constituted for peacetime operations with the 1st Panzer and 7th Panzer Divisions Dutch formations. The 7th PZD was put at the disposal of the Allied Rapid Reaction Corps. Before 2001 the IIth corps would have exchanged a division (5th PZD) with the 5th US Corps. The 10th PZD, also part of this IIIth corps was allocated to the Eurocorps representing the German half of the Franco-German Brigade. A new reorganization until 2012 saw the Corps disbanded or replaced by multinational corps. Although heavy brigade did not change, HQ of several units were merged (mostly by cost constraints) like the Airmobile Operations Division and Special Operations Division headquarters, while the 13th Mechanized Infantry Division headquarters was disbanded in 2012 as the 1st Airmobile Brigade. In 2015 the Heer represents 60,857 soldiers on active duty. Specific to the German Army, regiments are rare and Battalions are directly subordinate to brigades or divisions as divisional troops. The BDW intervened under the UN banner in Somalia in 1995-97 (UNITAF then UNOSOM II), in ex-Yugoslavia 1995-99 (IFOR in Bosnia and Herzegovina), and more specifically took part to the Operation Libelle during the Albanian riots in 1997. German troops also participated in the KFOR responsible to peacekeeping operations in Kosovo (1988-99), operations during and after the battle of Tetovo (Macedonia) in 2001, as known as Operation Essential Harvest altogether with French and Spanish NATO troops. More famously German troops were deployed in the 2000s in Afghanistan as part of ISAF, deploring 57 casualties at the end of the intervention. 850 German troops were deployed in Operation Resolute Support until 2014, as part of NATO. In 2011 (the last known intervention in Europe of the BDW) German troops took part in KFOR deployed in North Kosovo during the crisis. The standard version released in 1990, right at the end of the cold war. It was a considerable leap forward in armor which was completely overhauled and improved, especially for the turret. It was even superior to any other protection designs anywhere at the time. It is also known as the “short barrel” compared to the 2A6. The 2A5 is now in storage, upgraded to the 2A6 standard or has been exported. This new version of the Leopard 2 was introduced in 1998 and distinguished itself by a new, long 120 mm L/55 Rheinmetall barrel. It has the same upgraded armor as the previous Leopard 2A5 (1987). Older versions were gradually upgraded or sold. KMW also produce the 2A7+ for tanks with extended urban combat capabilities. The “revolution” package came as an export upgrade. In total 250 are in service today, including 135 Leopard 2A6, 70 Leopard 2A6M, 20 Leopard 2A7+. This brand new IFV is intended to replace the older Marder IFV. 349 Schützenpanzer Puma are in order, deliveries started in June 2015. Standard wheeled APC of the Bundeswehr, still 765 in service. 144 are currently in an upgrade process. New 8×8 APC of the Bundeswehr, replacing the Fuchs. 272 in service, 131 in order. Standard IMV (Infantry Mobility Vehicle) of the Bundeswehr, tailored for low/medium intensity areas. 550 in service. 4×4 recce vehicle of the German Army, also produced by and for the Netherlands. 222 in service. Standard 6×6 heavy MRAP of the Bundeswehr. Joint production with Iveco in Italy. The standard light recce vehicle developed on the Mercedes Benz G chassis as a light utility recce/liaison vehicle. 331 are in service. Standard medium 4×4 MRAP. Built by Mowag Switzerland. 495 in service. Standard self-propelled howitzer of the Bundeswehr. Also in service in Italy and the Netherlands. 154 in service but 81 are to be kept active due to budget constraints.